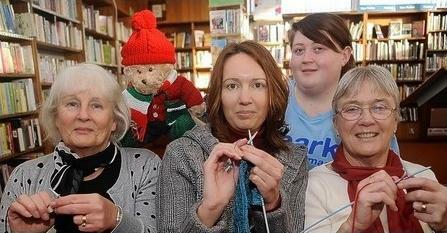 Knitters’ at Pennard Library show where (and how) to ‘cast on’. IF you want to got those needles clicking here are some groups which meet in the Swansea Bay area. The Knitty Kitty Knitting Club, at Townhill Library on Fridays from 4pm to 5pm. The Friday evening knitting group at Sketty Library from 5pm. The adult knitting and crochet class at Townhill Library on Mondays from 10.30am. Craftymoves knitting group meets on Wednesdays from 5pm at the shop in Llanelli’s Station Road. A Good Yarn in the Morning goes ahead at Gorseinon Library on Tuesdays from 10.30am. Adult knitting group at Pennard Library on Wednesdays from 10am. Pontardawe Library every Tuesday at 2pm. 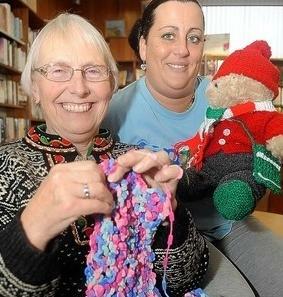 Knitters’ at Pennard Library show how they too can do their Grannies’ favourite pastime! ONCE upon a time the gift of a homemade jumper for Christmas could strike fear into the heart of the fashion conscious. The idea of reindeers, snowflakes and Argyll patterns on tummy hugging knitwear conjured up Andy Williams Christmas specials and Alan Partridge. But if you wait long enough everything becomes cool again. And the popularity of Scandinavian drama series The Killing with its leading lady kitted out in natty, traditional knits has helped make hand-crafted woollies all the rage. Sales of wool are up almost 30 per cent. There is also a wave of interest in knitting circles, with new members joining to swap wool and patterns. Youngsters are digging out mum or gran’s old needles and having a go too. And they are in starry company. While some Hollywood leading ladies might spend their time between takes knocking back their new mown grass-coloured detox shakes, Cameron Diaz, Nicole Kidman, Julia Roberts and Judi Dench have all been spotted poring over a knitting pattern and getting to grips with some purling and slip stitching. Valerie Bird, aged 69, is one of the more experienced stitchers at the Pennard Library knitting group, which gets together every Wednesday morning. She says it has been a lifelong interest for her and she is pleased to see so many new crafters appreciating its pleasures.